We came home from Mass and errands on Friday to find that we had lost a third of a tree. Thankfully, this tree is close to the street, not the house, and the side that went fell on top of our mailbox and not on top of the neighbor kid's truck parked in his driveway next door. Husband spent most of the weekend chopping up the ginormous section (it's in the dictionary!) of this Bradford Pear that came crashing down because of the sheer weight of the 20 year old tree. The kids and I were only gone for a few hours and there was no wind or storm to speak of that would have caused this. The most frightening thought I had was that Husband had been mowing under that tree Thursday night. He teased that he must have bumped it pretty hard. (I guess he just doesn't know his own strength! : ) I am envisioning several guardian angels holding it up as he darted under it with that loud machine that would have prevented him hearing any cracking before it was too late... OK... not going there. In other news this weekend, I am now officially considered capable to keep children safe by our diocese. I attended the required three hour waste of time training session yesterday. Please don't mistake me, I am not making light of the subject, just laughing at the ridiculousness of the way the information (of lack thereof) was presented. I think I learned more watching a Dr. Phil interview with an offender behind bars. They spent so much time talking about why we need to be trained, how it benefits the children and the church and so little time actually giving us "the rules". But, I completed my three hours so now, I am perfectly qualified to participate with my own children in the Blue Knights/ Little Flowers group in the parish hall. That's right. I had to take the class in order to help my own children study the virtues and do crafts. Again... not going there! The last of our excitement was probably the most unpleasant... BigBoy got an owie on his ear. Not the soft, fleshy, lobe part but the hard part in the middle (or the antihelix as I just learned by googling "ear anatomy"). It looks terrible! All purple and swollen with a white line running across the skin. I actually called the pediatrician last night. (Even though I luh-ove our doc, I don't usually run to him for every little scrape and sniffle but this owie was a doozy!) Bigboy had tripped and hit his ear on the side of the coffee table in the playroom after scampering inside from playing in the "ool". He is bearing all things with patience and cuteness as is his way. And on that note, I will close our wrap-up with the Potty Training Weekend Report... Light tinkles scattered throughout the day. Unexpected stinks during the naptime hour. Minor trauma but no serious loss of confidence with this accident. Lots of juice and watermelon in the forecast to help any high pressure systems move down into the potty. Wait... this just in. We have a report that there's something strange in the potty. Details will not follow, I promise. Yikes! 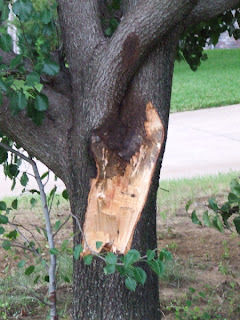 So glad no serious damage was done.Bradford pears are notorious for falling apart that. Bad branch-trunk joins. Your potty forecast cracked me up! I understand the reasons, of course, but I'm glad to see I wasn't the only one annoyed with the legal red tape - it's why we're not participating in girl scouts. Sorry about your tree! 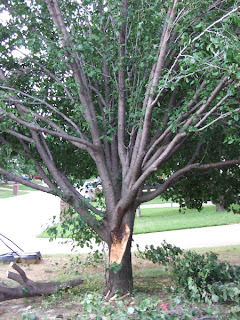 It's so common in Bradford Pears, it is plagued with weak branch structure. And congratulations on the potty front! Proper pruning will eliminate that weak crotch forks--at least when they are young. These trees were about 17 years old when we moved into this house. What should we do now to take care of them? Husband wants to chop them down and plant new ones. I'm with your husband, I'd take it down completely. I imagine it looks pretty weird with 1/3 of the canopy missing, and your grass looks like it's been getting too much shade. I did some research after the little live oak in our back yard died, and am planning to replace it with a "brandywine red maple". We wanted to put a Chinese Pistachio in front of the house for some shade. Does anyone know if these have the same problem?